Founded in 2001, Foxit Software Company is the industry leader in the OEM licensing of industrial standard electronic document solutions including in ISO 32000 PDF. In 2004, Foxit launched its award winning product – Foxit Reader, a small and fast PDF document viewer with extremely easy-to-use features and Foxit's best-selling desktop software – Foxit PDF Editor. With over 90 million Foxit Reader downloads worldwide, Foxit software has become a high quality, affordable and popular alternative to other PDF software tool suppliers. Foxit's corporate vision combines our core values of innovative, standards-based technology and unrivalled customer support, with a deep commitment to sustainable, environmentally-sound products and services for the global business community. With operations spanning the globe, Foxit Software is at the forefront of cost-effective, collaborative document management solutions for today’s distributed enterprise. Foxit’s award winning software products include software applications for reading, creating, organizing and securing PDF documents. Foxit PDF solutions range from handhelds to desktop to enterprise to on demand — enabling businesses worldwide. Customers who license Foxit technology for use in their products include Microsoft, Intel, Hewlett Packard and Amdocs. Foxit recently introduced a complete PDF Security Suite for enterprises to deliver cost effective PDF policy protection and PDF reader extensions capabilities to any business running Microsoft Windows Server® or Sharepoint® with Active Directory® Rights Management Services (AD RMS). Foxit PDF Security Suite includes the Foxit RMS and Foxit Phantom products making it easier to protect sensitive PDF documents to prevent loss of valuable company assets, manage AD RMS policy templates associated with PDF documents and view the protected documents. Foxit is also a pioneer in offering OnDemand CM, a service-based content management system, built on a patent pending technology. On Demand Content Management makes it easier to access, render, route and share documents easily over the web with high performance and integrity. Finally, the growing popularity around Foxit ebook reader eSlick Hardware has already been making waves in the market. Foxit eSlick enables one to read books, favorite novels, magazines etc on the go and fits into the hand just like the palm desktop. Foxit Corporation has positioned itself to be a PDF technology solution provider and it has become an alternative to Adobe for many PDF users. Foxit is dedicated to providing high-quality products for PDF file printing, PDF displaying, PDF graphic designing, and PDF text processing. Foxit will keep its development efforts on enabling electronic books, business document exchange, document archiving, digital rights management etc. Also Foxit will actively contribute to new PDF standards. New Packaging Makes It Easier To Purchase, New Features Make It More Secure The new PhantomPDF packaging makes it easier for users to find the solution that best fits their PDF requirements. PhantomPDF is available in three editions that help consumers, home office workers, small and medium-sized businesses, and large enterprises read, edit, create, organize, and secure professional PDF documents. 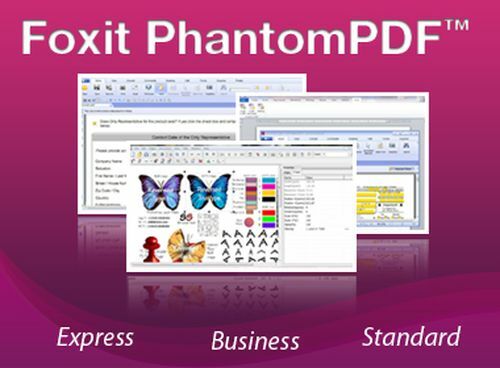 Great for home/home office or business users, Foxit PhantomPDF Express helps you create standards compliant PDF files from hundreds of files types up to 3 times faster than with competitor tools. You can create PDF directly from Microsoft® Word, PowerPoint®, and Excel® with one button click or batch create PDF documents from other common formats. Plus, you can use the convenient annotation tools to add comments, highlights, bookmarks, and more. Super-fast indexing allows users to index a large amount of PDF documents and then quickly find text within these documents. Built on Microsoft’s IFilter indexing interface, Foxit PDF IFilter extracts the contents, properties and bookmarks from PDF documents, and returns the index results to search engine software on Microsoft Windows. Foxit PDF IFilter allows any size collection of PDF documents to be rapidly searched on the desktop, a corporate server, or via the Web via keywords. These PDF documents can be files, email attachments or database records.